Idealised models such as ITIL®, COBIT and ISO20000 are all very well for theoretical discussions, but more and more people are discovering these models just don't fit the way we do things in the real world. Join the movement that is sweeping the ITSM community. Find out about Real ITSM, as it is done in the real world. Real ITSM is a satire created by The IT Skeptic. Read more about Real ITSM here (and see some samples from the book). 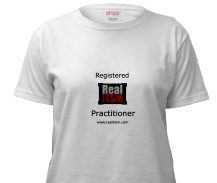 The official Introduction to Real ITSM introduces Realitsm to the world! Now on Kindle!!! The Real ITSM Institute (RITSI) is all for anything that allows pre-emptive problem management. Since the probability of technology ever doing this is near zero, we have researched a number of alternatives for you, including astrology, tea leaves, and goats' bowels. In the end we settled on the most likely option for ever pre-emptively detecting problems: Jedi Problem Management. What to give IT colleagues and friends this Christmas? The Introduction to Real ITSM book is perfect: funny, thought-provoking and short... and reasonably priced. You asked and ... eventually ... we delivered. CultITSM is pleased to announce the release of the popular Introduction to Real ITSM on Kindle. Yes folks, Introduction to Real ITSM is now available on the Amazon Kindle reading book device thingy. For all you tragic geeks with one of these new-fangled gizmos: you're welcome! Enjoy! P.S. Yes I own one. One of the most important documents in terms of defining the relationship between IT and its customers is the Service Cataract. This lists the available services in terms of their dependencies. The more dependencies there are for a service, the more that a customer will need to put in place first before the service is available. The official Introduction to Real ITSM is now available translated into Russian. No we aren't being funny - we couldn't have made this one up. Cleverics, one of Russia's leading IT management consultancies, has translated the book for the convenience and enjoyment of their Russian clients, associates and friends. We are in possession of a printed copy of the book - it is Real. Registered for EgoITSM as a RIP(OFF)?